In 1827 through to 1885 the way we saw the world and ourselves changed. From Daguerre via Fox Talbot to Eastman selling film the photographic image had arrived. Slowly over the following decades it became the dominant way in which we see our ever-changing world held still for examination. We forget now that when such images arrived they were at odds with the way people expected the world to look. People were used to prints and paintings where the world was carefully composed and tidy. Photographs after the novelty was over did not at first really catch on as a medium to record everyday life. It was portraits where the sitters were arranged before painted backgrounds to mimic paintings that first became a commercial success. Once the cameras found their way into amateur hands that all changed. At first due to the limits of long exposures groups of sitters still look contrived, but mostly gone is the attempt to ape the qualities of a painting. As the exposures shortened it was possible on a bright day to capture the hustle and bustle of a busy city, with the horses, carts, hawkers and jaywalkers making up the general hurly-burly. People were cropped off frame and caught in unbalanced poses. It was the Impressionists who first noticed it was a new way of seeing and many of those impressionist masterpieces you know and love were painted or refined from photographs. Monet, Degas and Renoir were all keen photographers. After that the hand painted view of the world was in irreversible decline. In the following decades we see the majority of representation both private, commercial and public recorded by the mechanical eye. Hand drawn illustrations have become in the minority and such work has largely been pushed to the edges of representation where a thing is imaginary, does not exist yet, or does not exist any more. Nowadays In am guessing the bulk of figurative artists probably work at least in part from photos, it being more convenient and cheaper than the alternative which might include hiring models etc. An important reason however is also that photographs are now how we see the world. None of us can help comparing any handmade representational image to the photographed image. Starting from an early age we all just see so many photographs that we cannot see any other way. It is hard to believe that when people first saw photographs of the familiar world they lived in they thought they looked wrong. We can never recapture how they saw or even recreate it by imagination. Now we tend to accept all the distortions that photographs suffer from without even noticing. The tonal compression the distortions of form, colour and proportion. We accept the perspective warping in wide angles or when we point the camera up or down, without a thought. If we look at one of those pictures of a social group 20 people wide then we do not notice that the ones at the edges are twice as fat as the ones in the middle. Artists even emulate the photographic inaccuracies, lens flare etc, to give extra veracity to their pictures! You frequently see people watching video in the wrong screen scaling, either squashed or stretched, without being aware that something is amiss. So where does this leave the observational painter of today? Well there seem to be several tactics. Firstly you might give your work a quirk that goes against the photographic grain. Do it in angular shapes in thick paint, incorporate dramatic drips and smears that cry out hand made. I often like paintings done in these ways, but there is always the uncomfortable feeling they are a bit like cheesy photographic effects applied to holiday snaps. Indeed Photoshop artists now regularly steal the quirks developed by painters in order to get that painterly feeling into a photo. More catching up on the oils now. Sometimes paintings are a real struggle. After one session I ended up with this widescreen take on Portland Bill. Working from reference taken with a few variations I was having trouble getting the whole lot to come to life. I find paintings that have some good bits but don’t quite add up to a whole the hardest to resolve. This one was so much so that I put it face to the studio wall and promptly forgot it! Later when I came across the canvas I decided to have a do or die bash at finishing it. Unfortunately I am missing a stage, the above is the final version. However on the second bash I changed the sky to give it more focus. However the general colour was still in the grey/ tan range. It still didn’t quite do what I wanted so I let it dry for a week or two and then glazed transparent colour over the top. To do this you must make sure you choose a transparent colour and use a decent glaze medium. You mix down the medium 4 parts turps to one part medium and then add colour to taste. You don’t want to make the colour too strong and it is best to build up in layers. On this I had just two glaze colours a quinacridone red and ultramarine. Glazing is very much like doing a watercolour over a grey painting, with the added advantage that you can wipe off and redo as many times as you want. 24in by 8in Oils. 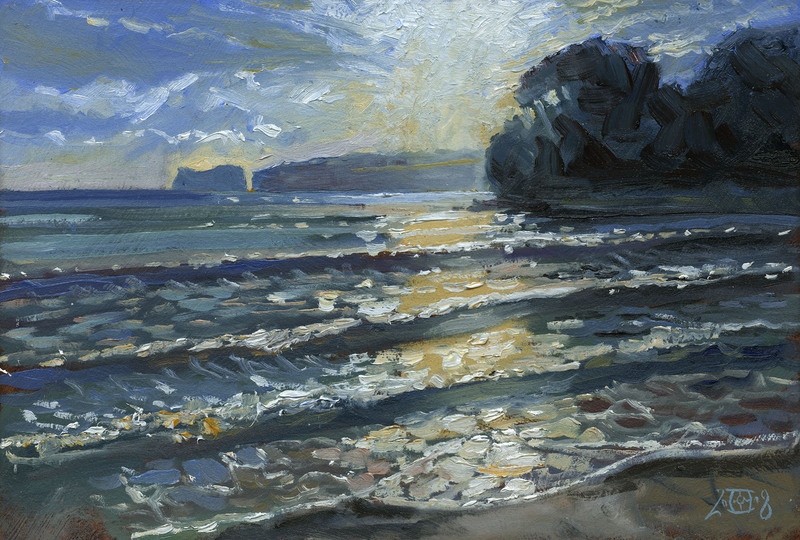 I did an earlier plein air of this one of Old Harry and at the time wished I had brought a wider board with me. So I set about a wider version. I think as with the previous painting this is a first stage. I can see potential but it needs more “zing” and focus. Again glazes are ideal for this sort of adjusting as all the fresh underlying brushwork is retained so you do not run the risk of it all getting too overworked. I will post the end result and try and take some photos of the different stages. 24in by 8ins Oils. This is a very quick but quite large sketch of Portland for a bigger painting. 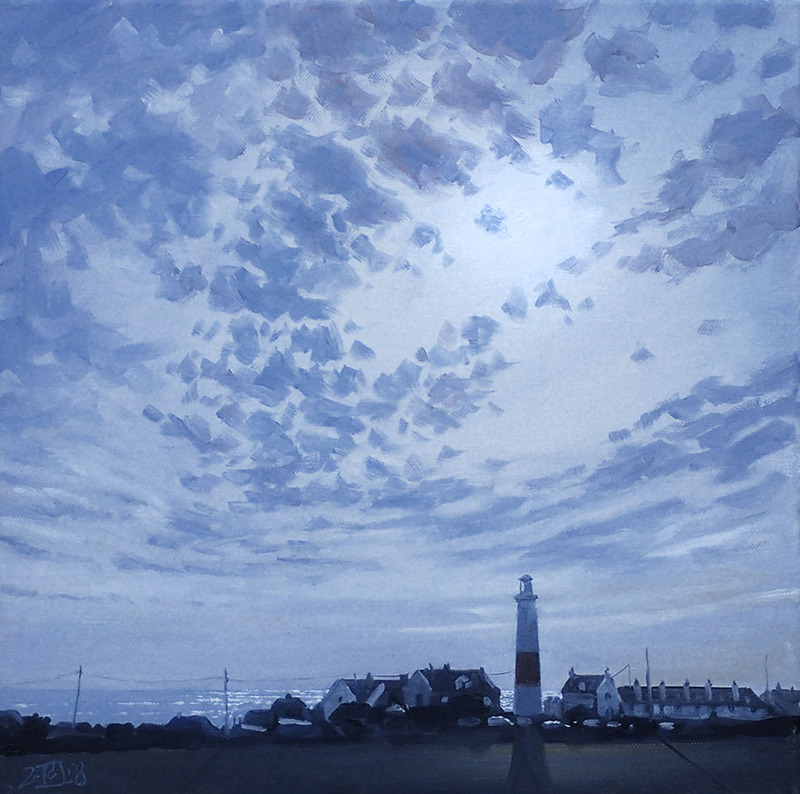 We had a series of days with wonderful skies so I wanted to do a large studio painting where the sky was the main event. This works OK but I didn’t really finish it as I felt that the land was still too important and could be reduced to a smaller scaled simplified strip at the bottom. I might adapt this one before setting out on a bigger canvas, we shall see. 16in by 16in Oils. 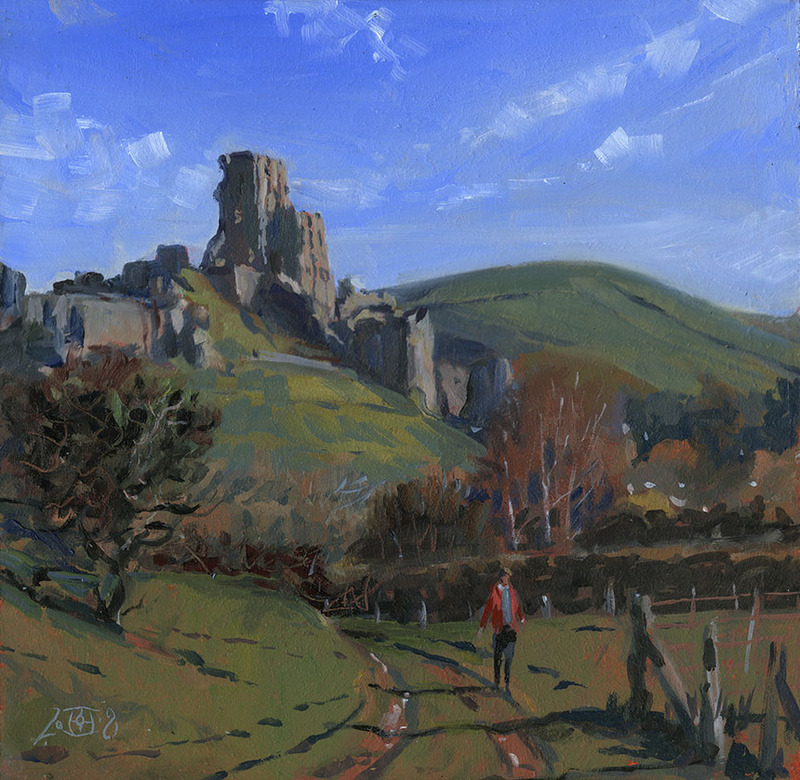 After a string of studio paintings it was great to get out and do some plein air at Corfe Castle. We got up early to catch the first light, but alas still arrived an hour too late! I think for this view you need to be there before dawn and paint it as it happens. Still this was great fun, painting from real life is in some ways so much easier than photos! 12in by 12in Oils. There same view a little bit later. I nearly always find the second painting of the day is better than the first, it takes one painting to get proper focus perhaps. 12in by 6in Oils. This was done as a demo for a local art group. It is always a little nerve wracking doing a painting live while an audience watches. I told myself before starting it would be educational for them if I made a dogs dinner of it… it would certainly have increased their vocabulary! I was in the end quite pleased with the result. I have to suppress the detail in the sea to the right with a glaze or two to focus the main interest on Golden Cap and then it is done. 24in by 8in Oils. I am still not caught up so more waffle quite soon I expect. “Photography is the very conscience of painting. It constantly reminds the latter of what it must not do.” – Brassai. I think there is some truth in this. Painting and Photography approach the challenge of producing an image from opposite directions. A painting starts with a blank, and the painter then makes a series of critical decisions about what to include in order to achieve the desired result. A photograph, on the other hand, automatically includes everything in front of the camera, unless the photographer, by means of cropping, exposure, use of perspective and viewpoint, and so on, manages to be more selective. This is the difference between the work of great photographers and the stuff that the rest of us produce. I use photographs a lot to provide the source material for my paintings – the camera is largely my sketchbook – but the photographs I take to work from are very different from photographs I intend to remain as photographs. I will take a number of different exposures, viewpoints, details, none of them remotely worthy as photographs, but as a resource hopefully giving me enough information to make informed choices when I come to attempt the painting. I know this is a vexed issue, and many painters have regarded the camera as the enemy, but it is, after all, just another tool we can use, as well as having the potential to be a creative instrument in its own right. Hi Martin, thanks for a very thoughtful comment. Firstly I would limit it something that both media do, IE recording and representing the perceived world. I agree photography is just another tool and one that allows you to paint paintings that would have been impossible without it. I had to think about the different directions thing and I’m not sure about the blank idea. After all the canvas is the equivalent of the unexposed film or the inactive sensor. They are both part of the medium not the intention. That each sort of image production begins with a choice might be my starting point. Thereafter the two media can diverge. Both can be light from the world activating a sensor, the chip or the retina. Both can be the source for the other commonly a photo is the input for a painting but much of my career as a background painter for film and stills was doing a painting that made up part of a photo. One difference is the factor of time. If you did a 2hr exposure of a landscape all the activity from that 2hrs would be recorded. If a painter did a 2hr painting only chosen moments would be observed and recorded. Another difference would perhaps be the degree of selectivity of content. The camera records all of the content of the frame with complete continuity of detail. The painter only puts down what he or she selects to the degree their abilities allow. As to the using for reference, I feel there is quite a difference between the sketchbook and the reference snap. A sketch is not necessarily important for the resulting marks upon the paper but for the observation and looking and the resulting memories laid down in the artist’s head. The later sketch can be more of a trigger to release those memories than providing specific information. You could, of course, just sit sit look for an hour. However there is something about the act of drawing that fixes the visual memories in the brain. Not only that years of doing that type of observation build up and enhance your visual memory giving you a store that you can draw on later. 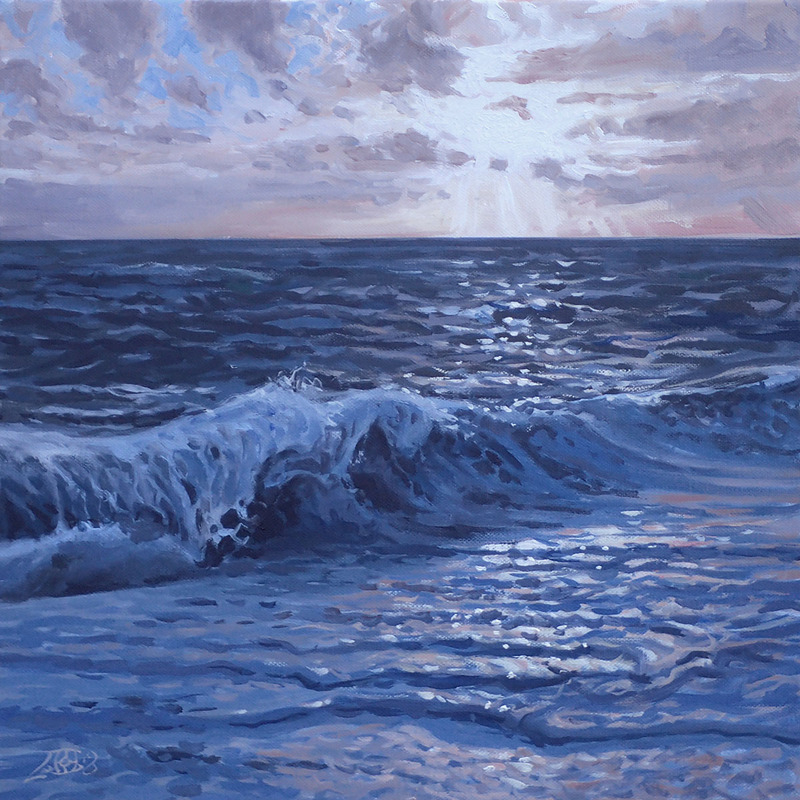 I have over the years persuaded several painters to reduce their reliance on photographic reference and work more from direct observation. Once hooked none have gone back, indeed several have said that painting from photos has become difficult. This is I suspect because painting from direct observation is easier but less convenient and doing good work from photos is convenient but more difficult. I would though stress that a knock ’em dead painting is possible by either route and photographic reliant painting has hugely broadened the number of things that can be made into a painting. Hello Rob, thanks for your response to my comment. The relationship between painting and the photographic image has interested me for some time. I agree that the blank canvas has a corollary in the unexposed film or sensor, but I think you identified the crucial difference in the two media – the element of time. Both can involve lengthy planning and setting up, but the image formation is instant with photography, the time element being more optional in the form of darkroom or photoshop techniques. There is no optional element to producing a painted image – the hours have to be put in. As far as selectivity is concerned, I feel painting is by nature more additive, the painter deciding what to put in, whilst photography is more subtractive, the photographer endeavouring to exclude those elements which detract from the chosen image. I take on board your comments about sketchbooks, and I think there is truth in the “ease vs. convenience” argument. I used to use a sketchbook more years ago, I’ll try again this year!